One answer is, “The wind never stops, it’s always blowing somewhere, and sun and wind complement each other over the 24 hour day.” – so a distributed and well connected grid will always carry a baseload level of wind or solar energy. 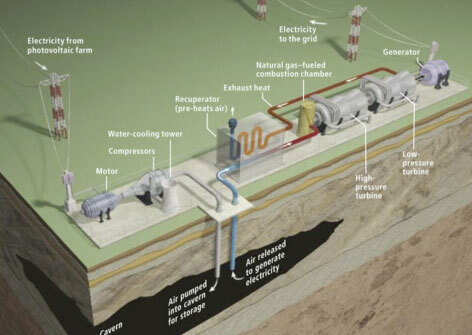 Other answers include off-the-shelf storage techniques like Compressed Air Energy Storage, (see above pic) where excess night-time or “off peak” electricity is stored as compressed air in underground caverns. Several projects using this design are currently in the works. In addition, for some locations, pumped hydro storage is a good alternative. A new alternative I had not heard of is a smaller scale, more personal option, Electric Thermal Storage. For any kind of storage, the trick is to find a technique that economically converts electricity from wind to an easily recoverable form that has a shelf life. Electric Thermal Storage uses high density ceramic bricks to store excess wind power electricity as heat, and allows homeowners to heat using excess electricity from renewable sources, 24 hours a day. Since wind tends to blow more strongly at night, when electric demand is low, this technology will probably have it’s earliest and most impactful application in storing energy from the new generation of wind turbines springing up around the planet. climate-changing fossil fuel, the collaborative Highland Wind project proposed by local wind developer Independence Wind will offer any Maine household in the Highland Plantation area near its wind farm a $6,000 “wind for oil” grant, that it can use to green the grid, according to Maine Public Broadcasting Network. The money would fund the purchase of an Electric Thermal Storage (ETS) “off-peak heating” unit from the local thermal energy storage company Steffes, which is partnering with Independence Wind to store the off-peak electricity the wind farm will produce at night. However, participating households could elect to spend the grant money on any renewable energy or energy efficiency investment. But thermal storage would be the best. A Thermal Electric Storage Heater can store a tremendous amount of electricity, in the form of heat, for up to 24 hours, so it is perfect for running on cheap night time off-peak electricity. When you want to warm up your house you flip a switch and it starts to release slow-release heat stored in very dense ceramic bricks. 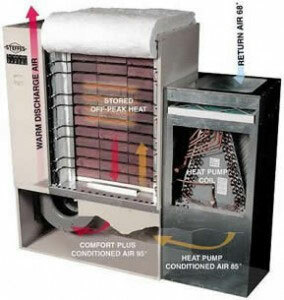 Because you can set it to use electricity at night at low night time rates, it is the cheapest form of heating. The way that this kind of heater works is that electricity heats coils that radiate heat to extremely dense adjacent ceramic bricks that store the heat in a supercharged thermal mass. Once they reach their maximum core temperature, they won’t charge anymore. At that point, the heaters’ controls won’t accept more power from the grid. The manufacturer claims utility savings of 40 to 70 percent for their customers, as well as mix and match systems that include heat pump and smart grid capability. Clearly I’ll have to be revamping my Wind Power videos, and my new years resolution is to ramp up production of solutions videos. For now, storage techniques like this are covered in “Renewable Energy Solutions” videos, Wind Power parts 1 and 2…. All these ideas are worth pursuing and putting into practice in order to determine how well they work and what practical improvements need to be made. Very encouraging stuff. We have been using water storage for years, and that is truly an energy storage solution with only electric energy as the input and output. All of the compressed air solutions I have seen so far use natural gas for the output turbine generator. Sure, the efficiency is substantially better than a traditional natural gas turbine, but a fossil fuel is used in order to extract renewable energy from its storage medium. I would prefer to use a more straightforward compressed air turbine arrangement on the output: essentially the compressor used in reverse. Then again, I might be missing something, like the efficiency may be worse than using the nat gas arrangement. Still, I say a true renewable energy storage unit should use only renewable energy as its input/output. The Electric Thermal Storage is a great idea. Seems like it would be a more compact and less costly energy storage concept as compared to a battery bank. Still, I say that a bit more battery R&D could easily allow for a flexible and reliable means to store the day’s energy needs for a household or business. All in all, energy storage is a great step towards smoothing out the demand curve for electricity such that our sources of energy can operate at peak efficiency. The anecdote from Germany concerning the negative rates tells me that energy storage could still further increase their grid’s efficiency. There are plans for compressed air storage that do not use natural gas, but instead store the adiabatic heat of compression in ceramic bricks similar to the home units above. Wow, what an educational and important post! The list of veggies is very helpful. Thank you for sharing your knowledge and thank you for the recipe too!This article is one of the best articles every i have read. I would like to thanks for this interesting blog post. « Global Warming. It’s just that. Global. Ask Bill Nye.